The bride and groom who already held their wedding came to visit to Tokyo salon! 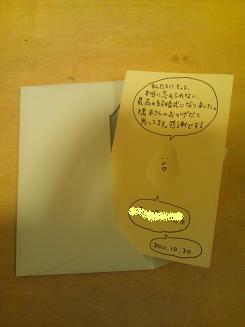 The cute card and the message written in it would be my treasure. The bride and groom had been preparing for their wedding which they invited their important ones:families, relatives and friends, even if they were busy with their work. The wedding day had been a warm and great time for bride and groom and also for their guests because they have prepared so hard for their guests. It was a great pleasure for me that they are going to make their own family from now and that they started their wonderful relationship. This couple would be dad and mom for the coming baby. I hope your baby would born healthy!